A recent report published by Infinium Global Research on air curtain market provides in-depth analysis of segments and sub-segments in global as well as regional air curtain market. 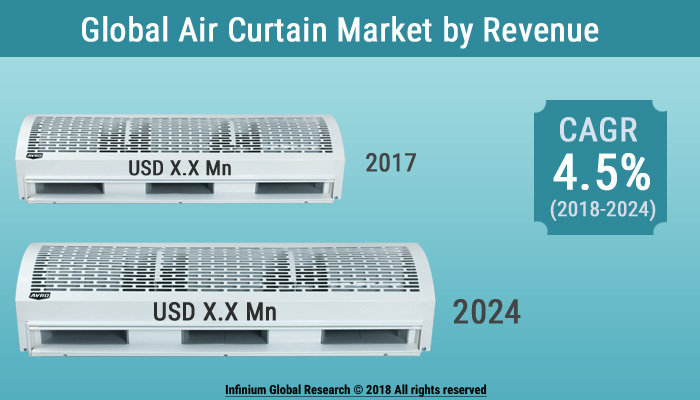 The study also highlights the impact of drivers, restraints and macro indicators on the global and regional air curtain market over the short term as well as long term. The report is a comprehensive presentation of trends, forecast and dollar values of global air curtain market. According to the report the global air curtain market is projected to grow at a CAGR of 4.5% over the forecast period of 2018-2024. An air curtain is a fan-powered device that creates an invisible air barrier over the doorway to separate efficiently two different environments (inside environment and outside environment), without limiting the access of the people or vehicles. It keeps the atmosphere clean from pest and insects, dust, airborne, pollution, smells, odours and stops draughts and cold or hot air entrance. The functioning of an air curtain is based on a high-velocity jet of air that covers all openings. Air curtains help to maintain the pleasant temperature inside the room during the hot and humid conditions. Global air curtain market is showing a positive trend of development around the globe. There are many factors that are helping to boost this market as it helps to reduce the building running cost, reduces the energy losses from the conditioned space, reduces the CO2 emissions, helps to maintain adequate environment, helps to control pest and insect inside the building, in cold rooms reduces misting, dry out the doorway and prevents ice forming on floors and due to many more application air curtains are becoming popular among consumers. On the basis of region, the global air curtain market is segmented into North America, Europe, Asia, and the Rest of the World (RoW). North America dominates the global Air Curtain market. Asia Pacific region is expected to grow at the highest CAGR during the forecast period of 2018-2024 rapid development of infrastructure. The Southern section of Asia is mild-hot in temperature, while the far northeastern area is a very cold region, and East-Asia has a temperate temperature, it implies that whole Asia-Pacific has diverse climate and temperature, and it changes as per change of orientation of earth to the Sun. Hence, the demand for air curtain in this region is around the year. However, growing urbanization and economic growth have led to an increase in the construction of malls, hospitals, commercial buildings, hotels, and manufacturing facilities. Additionally, the expansion of commercial spaces, new office floor spaces, corporate hubs and special economic zones (SEZs), and organized retail outlets is also driving the demand for air curtain installations across many developing countries. The report on global air curtain market covers segments such as type, applications, and product type. On the basis of type, the global air curtain market is categorized into re-circulating air curtains and non-re-circulating air curtains. On the basis of applications, the global air curtain market is categorized into commercial use, industrial use and other use. On the basis of product type, the global air curtain market is categorized into <1000mm, 1000mm-1500mm, 1500mm-2000mm and >2000mm. The report provides regional analysis covering geographies such as North America, Europe, Asia-Pacific, and Rest of the World. In this section, the key trends and market size for each geography are provided over the period of 2016-2024. The countries covered in the North America region include the U.S., Canada, and Mexico; while Asia-Pacific includes China, Japan, India, South Korea, Malaysia, and among others. Moreover, Germany, U.K., France, Spain, and Rest of Europe are included in the European region. The U.S. drives the growth in the North America region as it is the largest market in the region. The Asia-Pacific region offers substantial potential for the market growth owing to rapid growth in markets such as India and China. The APAC region is projected to experience growth at a CAGR of x.x% over the period. The report provides profiles of the companies in the global air curtain market such as Panasonic, Berner, Mars Air Systems, Toshiba, Mitsubishi Electric, Biddle, Systemair, Nortek, TMI Group and Envirotec. The report provides deep insights on demand forecasts, market trends, and micro and macro indicators. In addition, this report provides insights into the factors that are driving and restraining the global air curtain market. Moreover, IGR-Growth Matrix analysis given in the report brings insight into the investment areas that existing or new market players can consider. The report provides insights into the market using analytical tools such as Porter's five forces analysis and DRO analysis of air curtain market. Moreover, the study highlights current market trends and provides forecast from 2018-2024. We also have highlighted future trends in the air curtain market that will impact the demand during the forecast period. Moreover, the competitive analysis given in each regional market brings insight into the market share of the leading players. This report will help manufacturers, suppliers, and distributors of the air curtain market to understand the present and future trends in this market and formulate their strategies accordingly.